How are you powering your coils? What kind of gauge wire should work? I used some 10 gauge stuff with a cube relay. Some 12g from the ignitor to coils works good too. in also this case, you are eligible to use an MSD DIS2 box. I used a mitsubishi (mazda 1.6l miata) J702T ignitor, and the tacho output pin off of that wired directly to the volvo tach. i see. im guessing that a wire that goes to the stock ignighter is the tach? Forgive me, but I prefer visual diagrams. Would this be a simplified wiring diagram, essentially a transplanted Mazda Miata wasted spark system. Would I need moates to change the ezk tables to make this system work. and negative boss, it'll plug right in and work. you can change the EZK spark tables for more power or more economy if you want, but its not required. Cool. I picked up the Jwhatsit ignitor on my last JY visit. Now just need to find a coil next time and I'll be in business once the Buchka Super Happy, etc, etc gets here. pick your coils, I have been wanting to experiment with all different sorts. I have only experience with the subaru and miata coils, both of which worked well and handled boost no problem. I have yet to try pairing up the ls1 coils and toyota cop coils. I'm assuming pin 3 & 5 of the 203 unit won't be used to run any cylinders. Also, "Switched 12+", I mean 12+ when cranking too. Karl looked it over, and thinks it looks right, but if somebody sees something wrong with it, please point it out. I'm just curious if this is the definitive correct wiring for running the setup or is this for Launch control? All the credit to Karl for the instructions, but I'm a visual guy too. Also, if I chose to wire it this way(sans launch control), do I follow directions for the dummy coil, or for the alternate MS tach signal. Pardon the dumb question, but where is the best switchable 12v connection for this install? Sorry, I'm just not very electronic savvy. Last edited by ZVOLVO240; 11-07-2011 at 02:11 AM.. There's obviously no definitive wiring diagram since it's setup dependent. 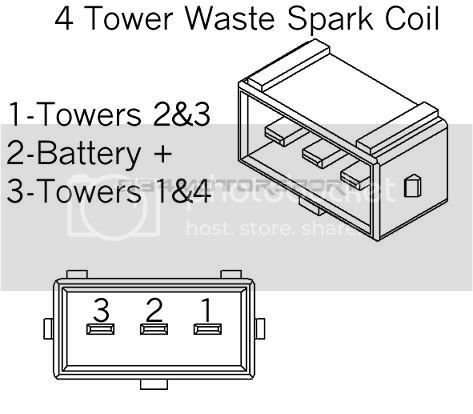 The above diagram is correct for a 203 module and the Bosch wasted spark coil. I would say the tach wiring depends on how reversible you want the system to be. Leaving the stock ignition module and wiring in place lets you quickly and easily revert to a distributor, but obviously at the cost of having to leave all the old stuff in the bay. I would probably just tie in to the existing 12v feed for the stock ignition module. It's already there and you know the wiring will be able to handle the current draw. mine. works, and works great! thanks Karl. more torque and much better top end! i used a 6 Cyl j somthingn or other ignighter from a mitsubishi and it works just fine. i ran the tach out put to the stock tach wire on the powerstage plug(red/white) and i also had to wire in the dummy relay to get the tach to work. i used the + (blue)from the power stage plug for the ignighter and the + (blue)for the original coil to power the 2 GM style dual post coils. i added extra wires to the EZK plug at spots 14 and 15. prety simple. for your wires in the box to the board i used O2 sensor wire, solders good and its good wire. I really hate sounding dumb, but what do you connect those 6 header pins (the ones that got bent in some packaging) to? I get all of the other connections and mostly how to run the dummy coil setup. Also, I don't mean to sound cheap but the coil pack is expensive new! Any source of a used form of it? I mean I can wait and save for it, but this is just out of curiosity. 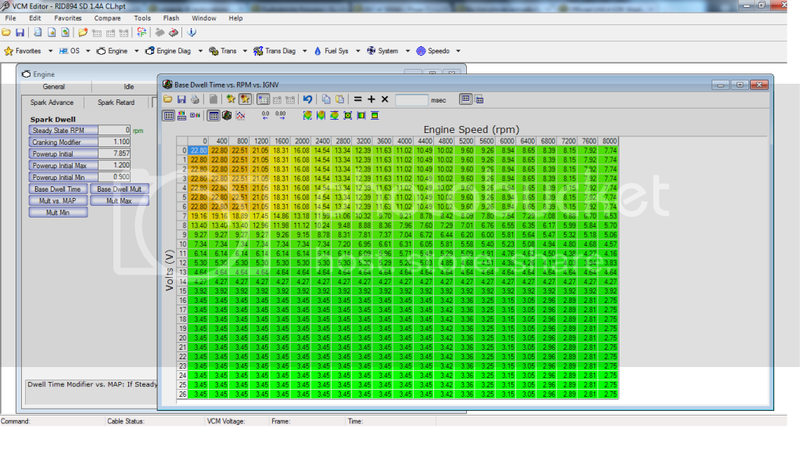 Last edited by ZVOLVO240; 11-07-2011 at 02:34 PM..
Header pins are for programing. the coil packs are all over the junk yards. ford, gm, mazda, mitsubishi......hit up krazy rays and go a scouting. Looks good. :-) Works well? Would it be best to unplug the 124 module? I would assume that the EZK box is still sending out a signal to 124 module (that's why you can use it for a tach signal). Right? So if the wasted spark board fails, and if the 124 module was plugged back in, the dizzy/coil reinstalled, it would run as stock (if the EZK isn't damaged)? This is correct. The stock function of the system is completely unaffected. was the general assumption on the 960 cops? Im assuming that these could be used with 960 ignitor module ? any externally ignited COPS will work fine, just wire them in series. I have tried the 4/5/6 cyl cops/ws thing, they are too short for the 16v head. as for using the yota cops, they might work still with an external ignitor wired in parallel, unsure on that. there's no way to wire the trigger signal from the EZK to the cops without keeping the output voltage from dropping (unless perhaps you use a 12v transistor on the buchka board, if possible, that would then send 2 6v signals to the yota cops to fire). I forget if nathaninwa is using COPS, he just might. he then might also be using the external ignitor with them. I have my toyota ones which fit nicely but there was talk about the volvo ones a year ago and Im not sure it ever got settled or not. they are too short for the 16v head. Hey karl awesome to see an engineering student applying their knowledge to things that actually interest them! I have a LS2 "yukon" coil dwell table here for reference. I've also included the coolant temp modifier table. If you need LS1 coil information from the pcm .bin file let me know.